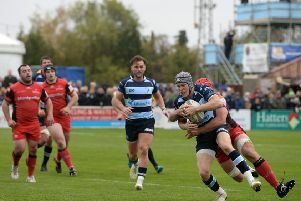 Ampthill director of rugby Mark Lavery hopes the match officials remain strong when his side travel to Plymouth Albion this afternoon in National One. The third-placed visitors make the long trip to the Brickfields Stadium to take on their opponents, currently second in the division, as position they will confirm with victory today. Lavery said: "It’s a big game. They’ve lost once at home this year, then that was to (the division winners) Hartpury. "It’ll be a big crowd, I’ve no doubt they’ll be in fine voice – I hope the officials are strong enough and not allow themselves to feel the pressure they’ll be under from the home support." Ampthill beat Plymouth 24-22 in the reverse fixture at Dillingham in December and only just lost 18-13 when they played Albion in Devon last season; so a win for the A’s would move them to within two points of their hosts with two games of the season remaining. "We’ve selected a match day 20 that’s a mixture of youth and experience, continued Lavery. "Guys like Ben Gulliver, Paino Hehea, Maama Molitika and Aleki Lutui, they’ve been around the block; [Syd] Blackmore and [Joe] Bercis, Matt Collins and James Wright – they bring an energy and enthusiasm. "I think we’ve got a good balance throughout." In the back line, Alex Mitchell, the Saracens and England U20 Number 9 forms a half-back partnership with up with Stef Jones at 10; Will Goodge  and Elliott Reeder  continue in the centre; Sam Baker [left] and Pete Weightman [right] on either wing, and Karim Lynch at full back. “We’re travelling with a bench that will make an impact in the final half hour,” added Lavery. "They’ll be favourites to win, given the circumstances, but we’re good too."